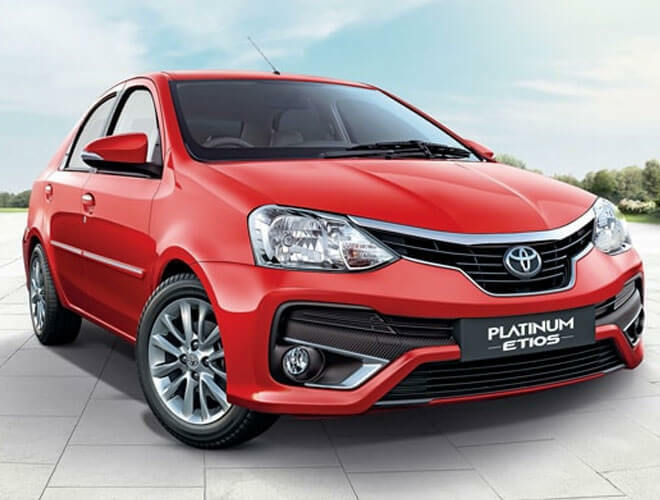 Toyota Etios sedan model has been updated with all new features as “Platinum Etios”.Etios has made with so many cosmotic changes compared to the previous versions. Etios comes with the Front Face lifting bumper with the highlighted dual tone colors and the engine is powered with 1.4 litre diesel engine boost the acceleration with comfortable driving mileage and performance ,the additional features as digital tachometer and with the dual front airbags,the Platinum Etios with the ABS and the child seat as mounted in various variants. In Toyota Etios coming to the interiors gave the best in class cabin space and a middle armrest at rear seat and also the removable head rest.the Platinum Etios comes with the color variants Vermilion red,Classic Grey,Silver Mica Metallic,Harmony Beige,Pearl White,Celestial Black. The new central locking system has placed on the driver dash board panel to unlock the doors in emergency. Prices may be varies depends on the variant.